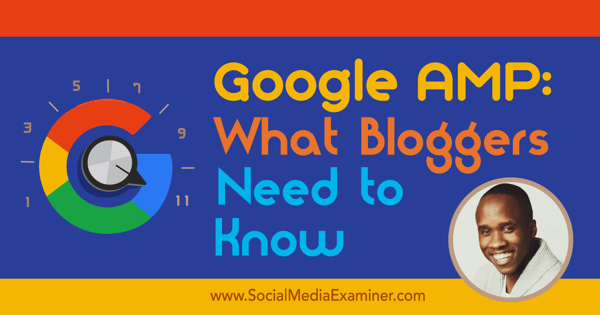 Have you heard of Google AMP? Want to know how it will impact your blog? 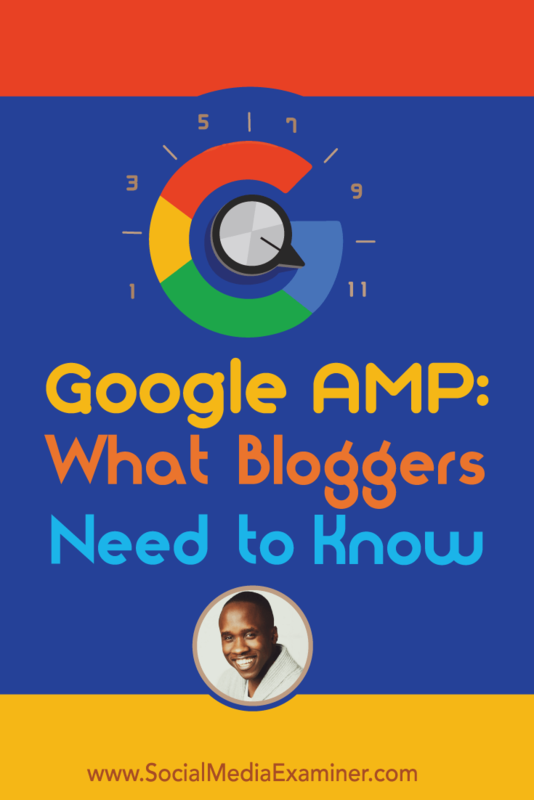 To discover more about Google AMP and the future of blogging, I interview Leslie Samuel. In this episode I interview Leslie Samuel, who runs BecomeABlogger.com, where he teaches people how to blog with purpose. He’s also host of the Learning With Leslie podcast and head of training for Social Media Examiner’s Social Media Marketing Society. Leslie will explore Google’s Accelerated Mobile Pages (AMP) project and what it means for bloggers. You’ll discover how to install Google AMP and related plugins on your WordPress blog. Listen as Leslie Samuel shares what marketers need to know about Google’s Accelerated Mobile Pages (AMP) and what it means for blogs. Google AMP stands for Accelerated Mobile Pages, and is a collaboration with a number of tech companies. Its goal is to improve the performance of websites on mobile devices, which in turn improves user experience. Kissmetrics did a study, which found that 40% of mobile users leave a page if it doesn’t load in three seconds. When that happens, these users don’t see the publisher’s ads, products, services, or events. AMP pages load 10 times faster and use 10 times less data. Plus, when people view a website on a mobile device, pop ups (such as ads and opt-in boxes) take up the entire page. There’s such a small amount of real estate on a smartphone, the pop-ups really inhibit the user experience. Google has already started placing Google AMP pages above non-Google AMP pages to mobile users in search. If you do a search for any popular topic, like politics, on your smartphone, only sites that have accelerated mobile pages enabled will show up in the top stories section. Google prioritizes AMP articles in mobile search. This is just the beginning. In the future AMP will be even more wide-spread. Listen to the show to learn how the Facebook Instant Articles feature is similar to Google AMP. In addition to the benefit of preferential treatment in search, AMP’s faster load times should decrease website abandonment and increase content consumption. Before discussing the cons, Leslie noted one thing in terms of how AMP is set up. When someone clicks on an AMP enabled article on their mobile device, “/amp” is added to the URL, essentially creating a second link. (For example, a Social Media Examiner article with AMP would have the URL socialmediaexaminer.com/ARTICLE-TITLE/amp.) There are now two links: the original link from the desktop article and the second from mobile (with /amp at the end), which is what Google will show above the initial version. AMP articles have /amp after the original url. AMP sites have specific standard dimensions, and elements such as sidebars, headers and comments are gone. However, there is still a lot you can do with design, Leslie explains. For instance, you can change fonts and colors, add a logo, and more. It just will not be as extensive as what you have on your website. 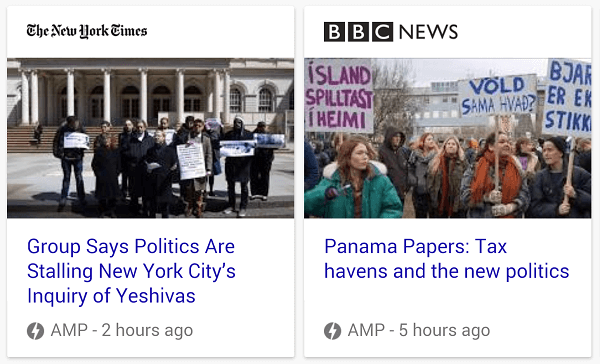 Articles with AMP show a single column that holds both text and images, so people won’t see anything you promote in the masthead and sidebar on your regular, desktop website. Leslie says while the AP version of some sites may not be as advanced as the desktop experience, they still look pretty nice. For example, The Washington Post has a simple top with their logo. Then, when you scroll down, you see other posts, social media links, and so on. 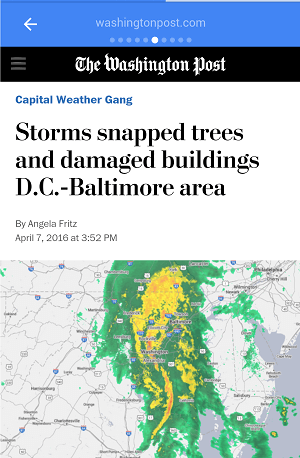 The Washington Post has a nice, branded experience for their AMP pages in spite of the restrictions. When I express concern that popups will be eliminated as scripts are removed, Leslie explains that opt-in forms are also gone. Because most of us blog to capture email addresses, I don’t believe a higher search rank is a fair trade. What good is it to show up in Google search if you can’t accomplish your business objective? For now, we are not enabling AMP at Social Media Examiner, although Leslie thinks I might change my mind. AMP is still in the initial phases and is increasing it’s functionality. For instance, AMP recently added Google Analytics integration. They are adding features in phases, testing them, and trying to see how they can best serve the publishers, website visitors, search engines, and others involved in the process. While there’s no specific navigation menu feature, Leslie says The Atlantic has created a workaround. At the bottom of each article, they share other recommended content and links to get to other pages on their site. 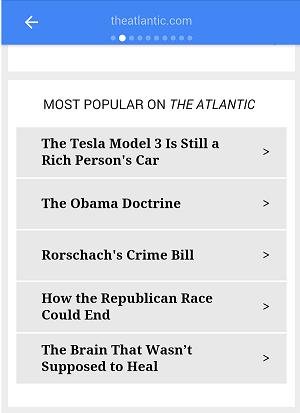 The Atlantic has popular links to the bottom of their AMP posts, as a workaround to no navigation. As a workaround for lead generation, Leslie suggests placing an image that links to an opt-in page at the bottom of AMP posts. That way, people can click it and go over to a page that is optimized for collecting email addresses. If you use AMP, you need to think about how to take advantage of the features available and still accomplish your business objectives. Leslie believes Google AMP is the biggest thing to happen to blogging ever, and says that while it’s optional now, it won’t stay that way forever. He stresses that the change is imminent and people need to figure out what to do when the shift becomes mandatory. Listen to the show to discover which social networks have indicated support for AMP. It is very easy to integrate your WordPress website with AMP. Go into the plugin directory and search for AMP. Once you install and enable the plugin, it will automatically generate AMP pages on your blog (with /amp at the end of your URLS). You can also install the PageFrog plugin to customize your site with design elements, colors, layout, logos, fonts, etc., in the settings, as well as to define which pages you want to be AMP; it doesn’t activate on any of the posts automatically. Both plugins are free. 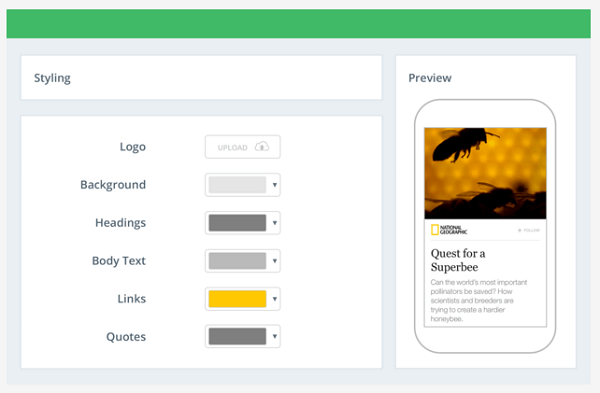 AMP gives you a white page with text and images, and PageFrog helps you design and optimize it. The PageFrog plugin allows you to customize your AMP pages. PageFrog also offers the ability to connect your AMP with Google Analytics, as well as to enable ads. If you use Google Analytics, Google recommends you set up AMP as a separate property. To get analytics for AMP, go into Google Analytics, act like you are creating a brand-new website, and paste the code into PageFrog. The analytics integration with Google AMP is limited and works in a way that’s different from regular webpages. For example, people don’t click in the same way on mobile, they press and swipe, so your metrics will differ. Google will be adding all kinds of functionality to AMP tracking that isn’t available in regular Google Analytics, but there are a lot of regular Google Analytics metrics that won’t be available for AMP properties. Listen to the show to discover how Google AMP is changing the way bloggers need to think about content and strategy, especially on mobile. Fluid Browser, which is currently available only for Mac desktops, is much more than a browser. When you use it to bring up a URL, set the size of the browser window to be full screen or smaller, and then make it transparent, so you can see through it. 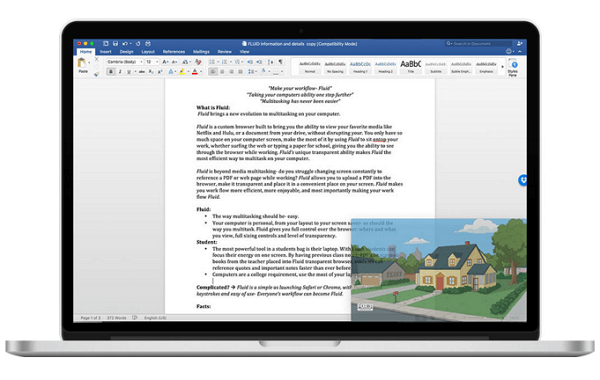 Use is to load PDFs, images, or movie files into your Fluid Browser. Watch a video while you work with Fluid Browser. For example, you can open up a tutorial video, and play it in the browser as you following along and do the work on your desktop screen. This is especially helpful if you have a small computer screen, since Fluid Browser gives you the ability to work underneath it. You can find Fluid Browser in the Mac App Store. Listen to the show to learn more and let us know how Fluid Browser works for you. 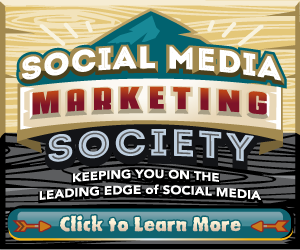 The Social Media Marketing Society is an exclusive membership community brought to you by Social Media Examiner. Do you struggle to keep up with all the new developments and frequent changes in social media? The Society will help you discover new ideas, avoid trial and error, implement the newest social tactics and find what works best in social media marketing. Need a competitive edge? Uncover the latest social media marketing tactics that deliver real results for your business on Facebook, LinkedIn, Twitter, Pinterest, Snapchat, Periscope, YouTube, Blab, and visual marketing. Find new ways to improve your content and measure your results–all from the comfort of your home or office. Society membership includes three original, highly tactical trainings each month, which last 60 to 90 minutes. Members also get access to exclusive private forums and monthly video hangouts, where you can connect with like-minded individuals, ask questions and help other marketers. One week only: Save $300 on your annual Society membership and receive a Social Media Marketing World 2016 Virtual Pass–FREE! Yes, all 100+ sessions from last month’s conference will be immediately available to you (a $697 value). This special offer ends Friday, May 6th, 2016. Learn more about Leslie on his website. Get guidance from Leslie on Google AMP. Explore Google’s Accelerated Mobile Pages Project. Read the Kissmetrics page load study. Get the AMP and PageFrog WordPress plugins. What do you think? What are your thoughts on Google AMP? Please leave your comments below. 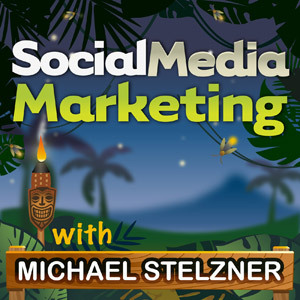 Leslie Samuel talks with Michael Stelzner about what Google’s Accelerated Mobile Pages (AMP) means for bloggers.